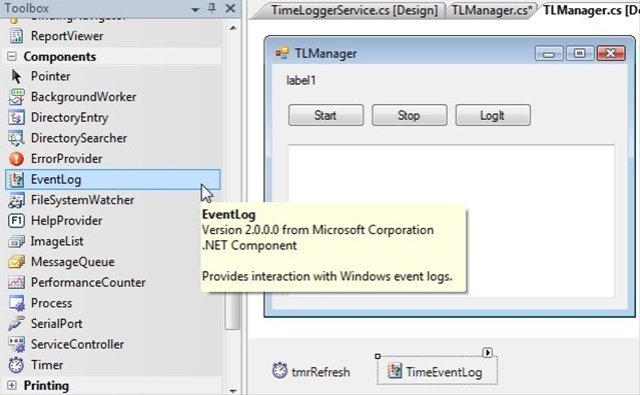 Yesterday we looked at starting and stopping your windows service from another application. It would also be helpful to be able to send other commands beyond the basic set of Start/Stop/Pause etc. On the good side, there is an API through which it is possible to send a command to your windows service, fairly easily as a matter of fact. The down side is it’s a one way communication, through the built in mechanism it’s not possible to return any data. Even more limiting is the only data you are allowed to pass in is an integer, and it’s value must be between 128 and 255. Even with those limitations, if all you need to do is execute a few simple commands the built in API can be more than enough to meet your needs. To illustrate, we’ll expand the windows service we’ve been using as an example. We’ll add the ability to send a command that will force the event log to be updated immediately, rather than waiting on the timer to fire off its event. First, we’ll add two items to the service. The first is a public enum. Strictly speaking we don’t have to use an enum, but it makes for more readability. Next we’ll add a new method to the windows service called OnCustomCommand. This is an override to the base classes method. As you can see it first calls the base method, then checks the value of the integer that was passed in, in this case against our enum. If it finds a match, it calls the WriteToLog method immediately. (The WriteToLog was discussed yesterday, so I won’t reiterate here). OK, that’s all that’s needed for the service. Let’s switch to our program, and add another button called LogIt. Now we’ll add a little code to the click event for the log it button. Like in our other examples we create a reference to our service by creating a new ServiceController object and passing in the name of our service. Once we have an sc object we call the ExecuteCommand method. This allows us to send messages to a windows service. Numbers 0-127 are reserved for windows, and are handled in the base class. 128 to 255 are there for your own use. In the example above I used 255 just to show that you could pass an integer value directly without using an enum. One last small item, we don’t want the LogIt button to be enabled if our service isn’t running. We’ll add a little logic to the SetDisplay, Start and Stop methods to include setting the buttons enabled status properly. Here’s the updated routines. And that’s all there is to it. 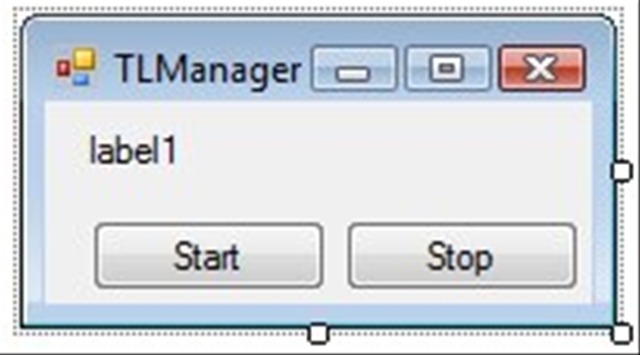 Compile and reinstall your service, then launch your TLManager program. 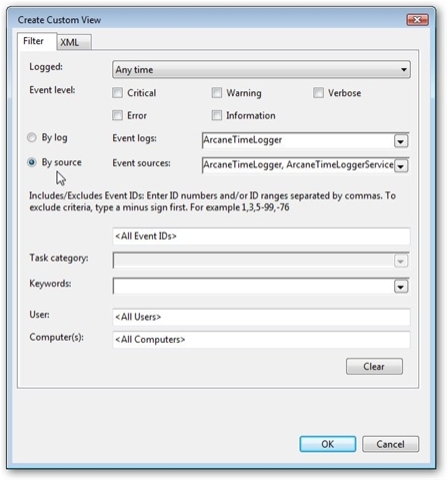 With the service started, click the LogIt button a few times then go into MMC and take a look at your event log. You should see a new message appear each time you click the LogIt button. If you’ve ever used SQL Server, you know it comes with a little control program that allows you to start and stop the SQL Server service. Wouldn’t it be cool if you could write a small program to do the same with your service? Well you can, and today we’ll learn how. Before we begin, I made a few little tweaks to the TimeLoggerService source code that will make it a bit easier to work with, and implement some of the things we’ll want to do in our control program. 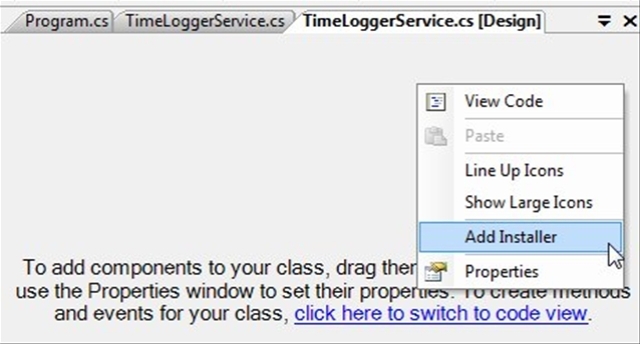 In the class constructor, the only change I made was to change the time from 60 seconds (60000 milliseconds) down to 20 seconds (20000 milliseconds). To be honest I got tired of waiting on it to log for my tests. Next, I created a “WriteToLog” method that handles the actual writing of a message to the event log. This code is identical to what was previously in the timer_Elapsed event, except I take a passed in message and append the current date/time to the log. Note one other change, I modified it to use the LongTimeString instead of ShortTimeString, so I could get the seconds to display. I then modified the OnStart and OnStop to log start and stop messages for me, which is probably a good idea for your service to do too. Finally I modified the _timer_Elasped event where I’d taken the WriteToLog code from, and made a call to our new method. OK, that takes care of changes to the windows service. Now, let’s add a new project to our solution. 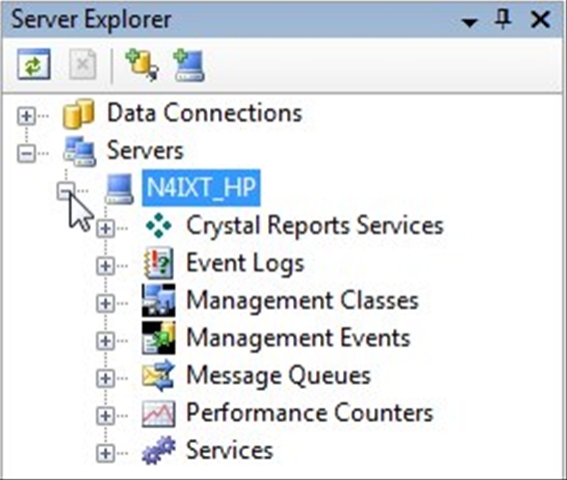 In the Solution Explorer, right click on the solution name and pick Add Project, then pick Windows Application. Note that we could do this with a command line app or class library as well, but for this demo we’ll use a windows form. I gave my new app the imaginative name of “TimeLoggerManager”. I renamed the Form1 to TLManager, and allowed VS to rename all the occurances of Form1 for me. I’m now going to add a few basic controls, one label (lblStatus), and two command buttons (btnStart and btnStop). I’m also going to add a timer control, tmrRefresh. Set the timer to enabled and pick a reasonable time, maybe every 10 or 15 seconds (10000 or 15000 in the Interval property, remember it gets set in milliseconds as well). In order to use some of the classes we’ll need, we must set a reference to the System.ServiceProcess assembly. 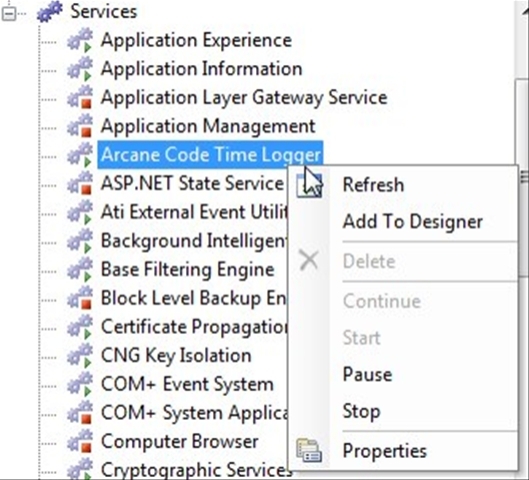 Right click on the TimeLoggerManager and Add Reference, then on the .Net tab scroll down to System.ServiceProcess, click on it and press OK.
Now switch to code view on the form, and in the using area add a “using System.ServiceProcess” reference. The first thing we need to do is find out what the status is of the service event. To do this we’ll first get a reference to our service by creating a ServiceController object, note in the “new” area we have to pass in the name of our service in order to get a reference to it. Once our object is created, I’ll pass it to a method that will set everything up for the form. The first thing called is sc.Refresh, this will cause the ServiceController to update all of the properties in our sc object with the correct values. Next I can query the Status property of our SC object, and set my command buttons and labels appropriately. Starting and stopping our service is just as easy, all we have to do is create an instance of a service controller object, and then call it’s Start or Stop method. Because you can also start and stop the service from other locations, like VS or the MMC, it’s important to keep the display in sync. In the event for the timer, all we have to do is create another reference and pass it to the same SetDisplay method so everything stays in sync. Go ahead and give it all a try. Start your service, then check it in the MMC. Use MMC to stop the service, then watch the app automatically update to reflect the status. 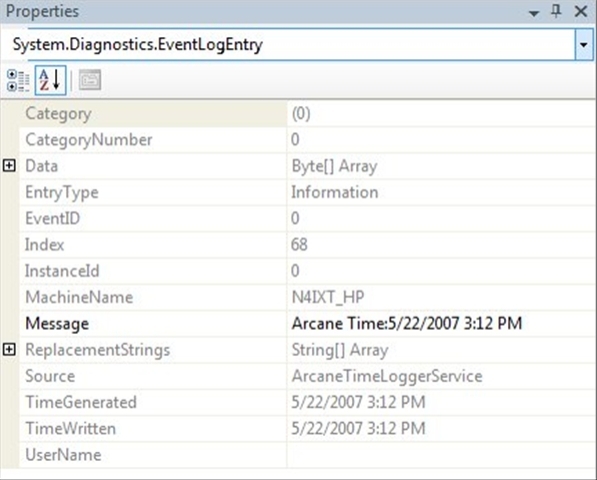 Tomorrow we’ll look at sending commands to our windows service, then to wrap up the series we’ll look at integrating the event log into our application. Stay tuned! Today in the US we are celebrating Memorial Day, where we remember all of the soldiers who fell in battle. So let me first start by thanking the families and those men who sacrificed themselves for the greater good. In keeping with the holiday theme, I thought I’d take a brief holiday from the Windows Services series and catch up on a few things. First, there’s been an update to my favorite Windows add-on, TouchCursor. The new version fixes the issue I mentioned with Virtual PC’s. The only issue since I’ve run across is in using it with Visual Studio and DevExpress CodeRush add-in. CodeRush also wants to use the spacebar for activation. However, I was able to easily change the activation key from CodeRush to something else, and problem was solved. Check it out at http://touchcursor.com/ or see my initial review at http://shrinkster.com/pf4 . Next, about a week ago I mentioned some great music to program to by a group called Midnight Syndicate. Shortly after posting I found out the Haunted Voices Radio podcast did an entire weekend of Midnight Syndicate, including playing their music and complete interviews. Check out Haunted Voices Radio at http://www.hauntedvoicesradio.com/modules.php?name=Content&pa=showpage&pid=6 or http://shrinkster.com/pf2 . Each banner ad is to a separate MP3 (the weekend was broken up into 2 hour chunks for easy downloads). I believe there are 17 in all. If you’ve been reading my blog for a while you know I’m a “tool freak”, I love add-ins and tools for Windows and Visual Studio. As such I’ve been wanting this book for a while, but since I’ve already got a huge stack of books I’m still reading through I was having problems justifying yet another book. The gift certificate gave me just the opportunity I needed to get this cool new book. At over 1200 pages it’s chock full of toys, can’t wait to dig in! 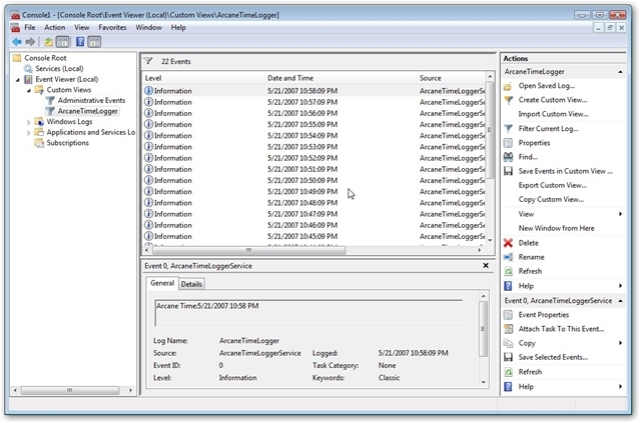 In part 1 of this series I mentioned debugging a windows service was a little different than normal debugging of an application. 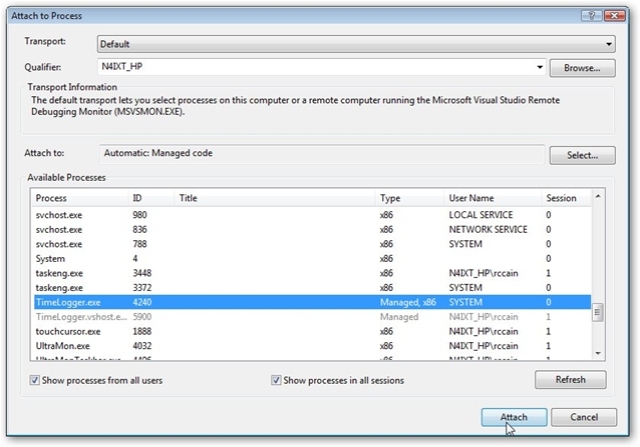 Today we’ll look into how you can debug your windows service. 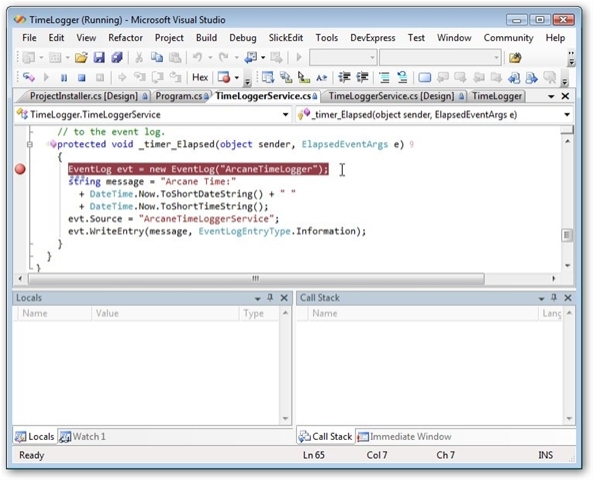 First, open Visual Studio and have your project loaded, if it’s not already there. Now go over to the MMC (as I described in part 3) and make sure it’s logging events. Now comes the neat part. 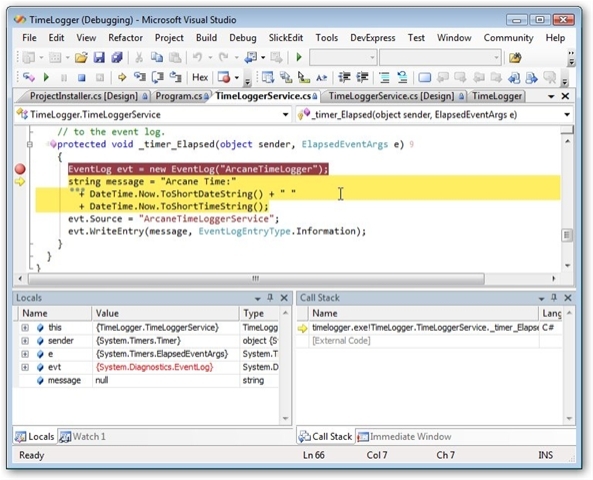 Under the Debug menu in Visual Studio, select “Attach to process…”. When the dialog below appears, you will need to check the “Show processes from all users” and “Show processes in all sessions” boxes. Now your list should update correctly. 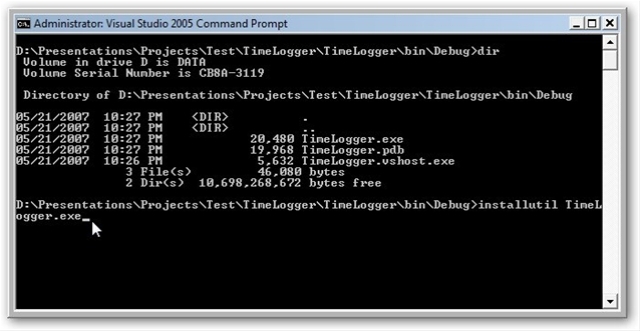 Scroll down and look for the process with the same name as your executable, in my case it was TimeLogger.exe. Click on it, and the click the “Attach” button in the lower left. Now sit back and wait a minute, when our service fires the _timer_Elapsed event it will fall into the standard debug mode you’re used to, as you can see below. In the screen above you can see where I took one step and am now on the line of code “string message =…”. I have access to my locals, as well as the call stack and other debugging tools. From here I can do the normal debug tasks, including stepping or just hitting F5 to continue. When you are done debugging and are ready to disconnect from the service, simply return to the Debug menu and this time pick “Stop Debugging” (or hit Shift+F5). Visual Studio disconnects you from the running service and returns you to normal code editing mode. Resetting for another test is still a bit painful. You’ll want to stop your service, then in your Visual Studio Command Prompt window run InstallUtil, this time with the /u option to uninstall it. (instalutil /u timelogger.exe). Then you can build, then reinstall your service. I said this yesterday, but I want to stress it again. If you are developing under Vista, it is vitally important you run VS Command Prompt as the Administrator (simply right click on the menu option and pick run as administrator). If you don’t do this, instalutil will fail every time. And that’s how you debug an windows service. It’s not really that difficult, now that you know the steps involved.